According to 21 separate studies provided by Baymard Institute*, 67.75% of online shopping carts are abandoned. How do you prevent visitors from abandoning their shopping carts? I’ll answer this question and provide some tips on how you can improve your shopping cart and checkout pages with new technology for ecommerce conversion optimization. Presenting a promo code on the cart and checkout pages can considerably boost sales conversions and it prevents visitors from leaving your site to coupon hunting or to compare prices. The key here is to offer an incentive of value. Since customers are turned off by unexpected costs, present them with the opposite: a discount or free shipping. By presenting a coupon code on your cart and checkout pages, you hit visitors with an incentive to complete their purchase at the most critical point in the purchasing process. You can run promotional offers on your site with Justuno! Justuno user, Nanamacs, presents their offer on the cart page so visitors can get their coupon code and immediately apply it to their order. Check out nanamacs.com for a great selection of women's styles! 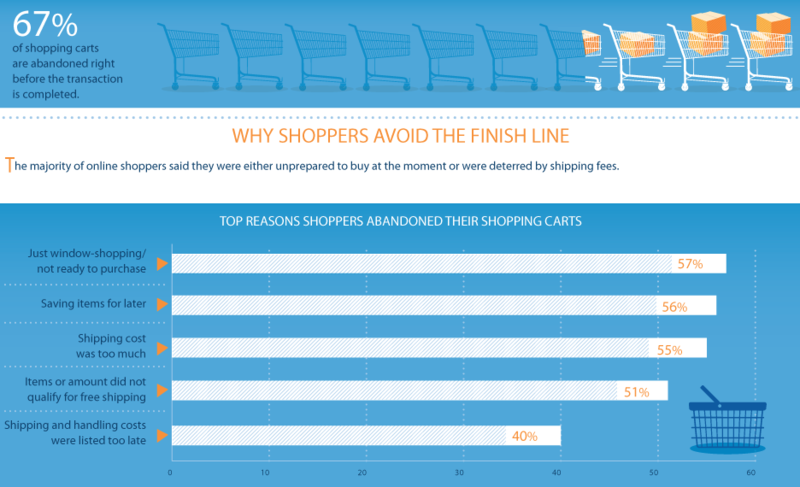 The #1 reason people abandon their carts is “unexpected costs” like shipping, taxes & fees. The last thing a customer wants to see is an extra $25 in shipping and processing fees. It discouraging and they probably will think twice about purchasing. The best practice to avoid this hiccup is to be upfront with shipping costs and other fees. Present all of your shipping information clearly on the cart page so there is no confusion for the customer. Provide a shipping calculator on the cart page. When customers are aware of how much they will be paying for shipping and extra fees, there is a greater chance of purchase completion because they aren’t caught off guard. Just make sure you aren’t surprising your customers with fees. Potentially the best way to increase conversions from your cart/checkout page is to offer free shipping. According to a Milo study, 55% of abandoned shopping carts are a result of shipping costing too much and an astounding 73% of consumers want to see free shipping in checkout. By eliminating shipping costs for your customers, you can significantly increase sales conversions and also increase the size of orders. A Study by Compete states that 93% of online buyers would be encouraged to buy more products if free shipping is offered. Check out this article from Web Marketing Today to get some info on how to approach free shipping to make it work for your business. Shopping cart abandonment also occurs when delivery times are longer than what customers expect or if there are limited shipping options. Provide a variety of options that can fit anyone’s budget and delivery time needs. Reduce the number of pages in the checkout process. Keep it simple. Only ask for personal information that is needed to complete the purchase and delivery. Although retailers may need this information, it consistently raises customer questions. “Why do they need my phone number? They already have my email.” You want to make the checkout process seamless so customers will complete the checkout. Here are 4 recommendations to cater to the customer purchasing process. Explain why you need that particular field of information. Customers won’t have any suspicions if you provide an explanation. Make unnecessary fields optional. Customers don’t have to provide this info if they don’t want to. Have a variety of payment options available. Credit cards, PayPal, Google Wallet, Apple pay, you name it. Customers have a ton of options to pay with so make sure you have an option that works for them. Offer guest checkout options. There’s something about registering that discourages customers from completing the purchase. Have your customers register after their purchase. 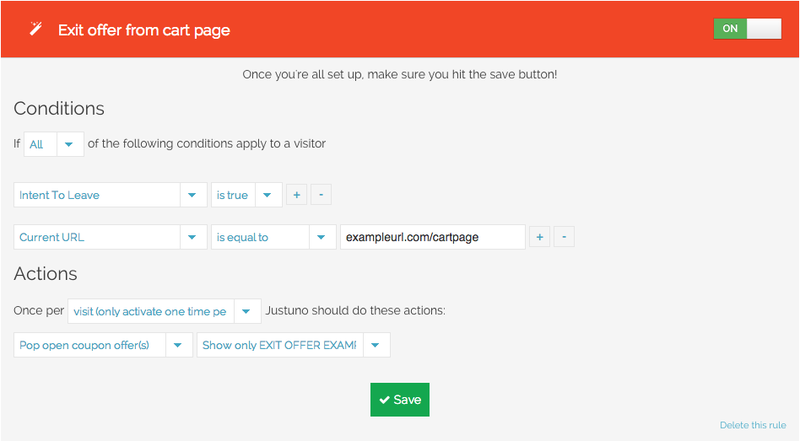 Easily embed a link that opens your default Justuno promotion. 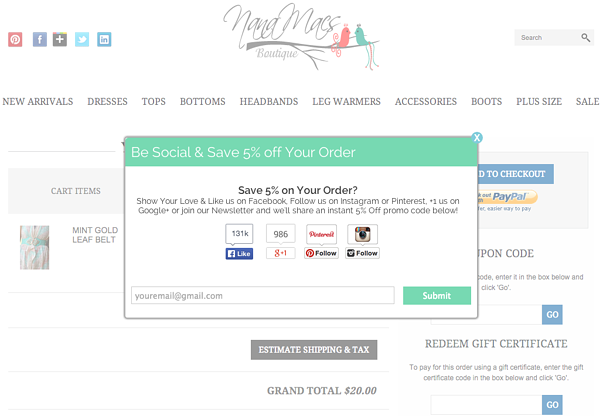 Providing a link on your cart and checkout pages is a great alternative if you don’t want to run a pop up. Place your coupon link near the coupon code entry field for easy use by your customers. Simply reference your default Justuno promotion, enter the desired hyperlink text, and paste in the desired location on the page. Check out developer support for more info and tips! Target visitors that are leaving your cart and checkout pages with exclusive exit intent offers with advanced targeting rules from Justuno. When a visitor tries to leave your cart page, an exclusive offer will appear to get them back on your site to complete the purchase. If you are having trouble with reducing shopping cart abandonment and bounce rates, then implement a promotion that will solve your conversion problem. Create an advanced behavioral targeting rule with the above settings. Be sure to have ALL conditions applied so the offer is exclusive to visitors that leave the cart page. Also create a specific offer that will appeal to leaving visitors. But seriously, don't go! Check out some case studies and some related blog posts below! Top Shopify, BigCommerce, Magento Marketing App Reviews and more. Justuno is a suite of tools for ecommerce marketing that gives you the ability to create and manage incentivized promotions allowing you to increase sales conversions, build your email list, and get social fans! The Dashboard also includes custom targeting rules, exit intent offers, and customizable tabs and pop ups. Justuno can seamlessly integrate with any website and email client making it easy for you to set up your always free account today!